A fantastic mural by the Italian artist Blu in Buenos Aires has been painted over. 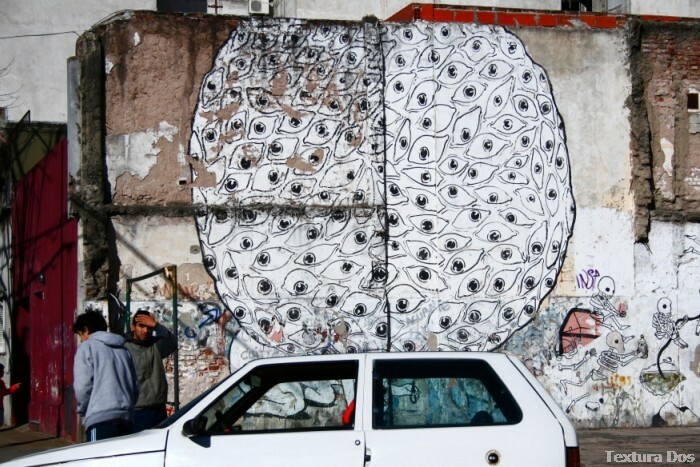 Photo of Blu’s mural from our book: Textura Dos Buenos Aires Street Art. The design featured an army of skeletons flying out of the head of a surreal creature with more than a hundred eyes and was created during Blu’s tour of South America in 2006 during which he visited Mexico, Guatemala, Nicaragua and Argentina. 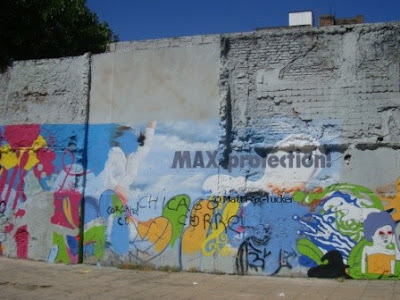 Blu’s design in Chacarita was covered over last Friday. A local resident told us that a French company was using the wall as the backdrop for a TV commercial and had permission to paint it. It’s not clear whether the TV commercial is for a condom or a deodorant. Whatever is the case, it stinks that a great design by Blu has been lost forever when there are so many other walls to paint around the city. This entry was posted by admin in News and tagged Blu mural Buenos Aires, Blu mural in Argentina, Buenos Aires street art book.